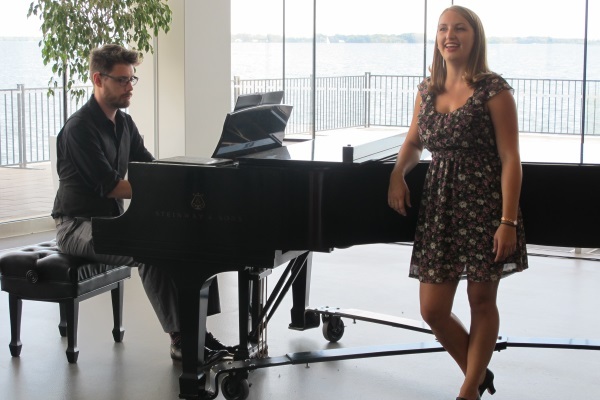 St. Lawrence College student Maddy Palmer performs a selection from 42nd Street accompanied by Queen's student Ryan Cowl on the piano. “We are excited to be partnering with St. Lawrence College once again. Building on the recent momentum in our arts programming at Queen’s, from opening the Isabel Bader Centre for the Performing Arts, to the celebration of the Dan School of Drama and Music following a $5 million donation from Aubrey and Marla Dan this past spring, the new Music Theatre program will enable our students to explore new career paths and significantly differentiates us within Canadian university and college based arts education,” says Daniel Woolf, Principal and Vice-Chancellor of Queen’s University. This is the third joint program between the two institutions in recent years - joining the Biotechnology and the Digital Music and Bachelor of Music combined diploma and degree programs. Original story in the Queen's Gazette.